The market may be volatile following the Independence Day break, but opportunities are abound for long-term investors. We enter July in a cloud of uncertainty. The stock market has swung wildly since the surprise decision by U.K. voters to leave the European Union, and it looks like interest rates are going to remain lower for longer. There's certainly no shortage of commentary regarding how investors should react to these developments. Thankfully, the simple tried-and-true strategy of buying great companies at reasonable prices never changes. We asked seven of our Foolish contributors to recommend a stock to buy in July. Here's what they had to say. Sean Williams: I know it's a total "homer" pick because I own it in my personal portfolio, but year-to-date weakness in Bank of America (NYSE:BAC) has led me to believe it could be a stock worth buying in July. The biggest issue facing Bank of America, and money-center banks, in general, is there's absolutely no certainty when it comes to near-term interest rates. After the Federal Reserve raised its federal funds target rate for the first time in nearly a decade in December, it entered 2016 with the idea of boosting lending rates about four times. All of that has been thrown out the window due to weaker jobs growth and GDP data. Bank of America and other banks had been counting on rising interest rates to boost their interest-based income and net interest margin. But not even Fed inaction can assuage my optimism. For starters, Bank of America has put most of its mortgage-based litigation in the rearview mirror. This means fewer expenses and better visibility for B of A, and more transparent operating comparisons for Wall Street and investors. Furthermore, Bank of America is regularly working to reduce expenses tied to its legacy assets and services, which should result in small losses from this segment, and improved profitability as a whole. 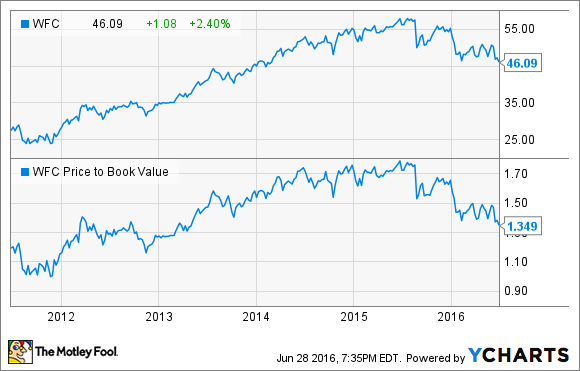 General cost-cutting is another reason why Bank of America looks attractive. Aside from reducing its legacy-asset exposure, Bank of America has also been able to scale back its overhead costs, vis-a-vis branch closures, to take advantage of the push toward mobile banking. Mobile and ATM transactions are substantially cheaper than in-person transactions, giving B of A an incentive to cater to mobile consumers. Bank of America also offers an intriguing value proposition. The company is trading well below both its book value and tangible book value, primarily as a result of its subpar return on assets, which sits at 0.72% over the trailing 12-month period. However, improved expense efficiencies, coupled with the expectation of interest-rate normalization at some point in the intermediate term, should help push its ROA higher. I believe it's a stock you can "bank on" over the long term. Tim Green: With the recent turmoil in the stock market knocking down prices, International Business Machines (NYSE:IBM) looks like a great deal for bargain-hunting investors in July. The stock trades for less than 11 times the low-end of the company's 2016 earnings guidance, and a 3.9% dividend yield that's well covered by earnings is icing on the cake. IBM is currently going through a companywide transformation, shifting its business toward high-value growth areas like cognitive and cloud computing. This shifting of resources, along with divestitures of under-performing businesses and currency fluctuations, have led to major revenue declines. IBM generated $81.7 billion of revenue in 2015, down from $104.5 billion in 2012. A long string of disappointing quarterly results has pushed IBM stock down over the past few years. But the company's strategy of going after areas where it can achieve a competitive advantage makes sense. Instead of competing on price in the cloud infrastructure market, for example, IBM is focused on solving problems for its enterprise clients. Watson, IBM's cognitive computing system, is being used in the healthcare industry for a variety of applications, giving IBM the opportunity to stake a claim in a multi-trillion-dollar industry. If there was ever a stock that required patience from investors, IBM is it. For long-term investors willing to block out the noise, IBM looks like a great stock to buy in July. Neha Chamaria: After a prolonged period of lull, the potash industry could finally be bottoming out, offering you an opportunity to catch the falling knife -- PotashCorp (NYSE:POT) -- in July. While demand and prices of potash remain muted, potential developments in the industry could signal a reversal. For instance, a possible reunion between Belarus and Russia-based Uralkali to control production volumes could go a long way in improving the demand and supply situation in the industry. Global potash markets suffered a massive blow after Belaruskali and Uralkali split three years ago. While it's mere speculation for now, Belarus' openness to calling it a truce raises hopes of a possible alliance that could help potash markets recover. Meanwhile, crop prices -- a key determinant of the demand for fertilizers -- appear to be stabilizing. Longer term, PotashCorp's leadership position in the industry remains a strong competitive advantage. As fertilizers boost crop yields, demand should only grow in the years to come in the wake of rising global population, and greater need for food. As of this writing, PotashCorp stock is down a whopping 50% in one year, and almost 10% year to date. I believe there's greater room for upside now than downside, and this could be a good time for long-term investors to consider the stock as it trades at merely 13 times trailing earnings, and offers more than 6% in dividend yield. Andres Cardenal: Las Vegas Sands (NYSE:LVS) is being hurt by weak gaming demand in Macau, and this is an important risk factor to keep in mind. On the other hand, demand seems to be improving lately, and Las Vegas offers big room for appreciation under such scenario. Due to economic headwinds and increased regulatory pressure on VIP gamblers, gaming demand declined in Macau over the last couple of years. In this context, Las Vegas Sands reported a 9.8% decline in revenue during the first quarter of 2016. Nevertheless, the company is gaining market share versus the competition, management is keeping costs under control, and the business is still producing positive earnings and cash flows. The company has increased dividends at an average annual rate of 30% from 2012 to 2016, and the stock price has languished since 2014. Because of these two factors combined, Las Vegas Sands stock is now paying a steaming-hot dividend yield of 6.1%. Interestingly, CEO Sheldon Adelson said in the last conference call that things are starting to improve in Macau, and Las Vegas Sands experienced the first sequential increase in mass gaming revenues in Macau since the first quarter in 2014. If data over the coming months confirms that the worst is over for the company in this much-important market, then Las Vegas Sands offers massive upside potential from currently depressed valuation levels. Dan Caplinger: I agree with Sean that financial stocks look attractive, especially after the massacre that most of them suffered due to the Brexit vote. But I think JPMorgan Chase (NYSE:JPM) is a better buy than Bank of America. Although most investors are focusing on the challenges from the U.K.'s exit from the European Union, JPMorgan has a history of capitalizing on the opportunities from such events. During the financial crisis in 2008, for instance, JPMorgan Chase didn't shy away from the strategic possibilities that the near collapse of the banking sector presented. Instead, it jumped at the chance to buy assets on the cheap, taking over the banking operations of Washington Mutual and negotiating with the Federal Deposit Insurance Corporation to protect itself from at least some of the legal liability involved. Not all of the company's moves worked out perfectly, as legal settlements over mortgage issues related to WaMu were costly, and the fire-sale purchase of Bear Stearns led to JPMorgan being liable for issues related to Bear's mortgage-backed securities. Nevertheless, the bank's stock has recovered all of its losses since the financial crisis, and it's in a good position to weather Europe's storms, and take advantage of whatever strategic opportunities present themselves this time around, as well. Brian Feroldi: With the markets trading within spitting distance of their all-time highs, many growth stocks are now trading at nose-bleed valuations. However, that's not the case at all in the biotech sector. Investors have shunned this group of stocks completely for several months, and many wonderful biotech companies are on sale right now. That's creating a great opportunity to buy shares of the highest-quality stocks from the group at a discount, which is why I think that Celgene (NASDAQ:CELG) deserves a closer look. Celgene has been one of the best stocks to own over the past decade thanks to a drug called Revlimid, which is used to treat the blood cancer multiple myeloma. Celgene rakes in billions in annual sales from Revlimid, and the company should have no problem continuing doing so for years to come. That's because Celgene was able to strike a deal with generic-drug makers last year that will keep copy-cat medicines off the market until at least 2022. Even then the supply will remain quite limited as the floodgates won't open fully until early 2026. That gives the company plenty of time to develop new drugs to keep its top line heading in the right direction. Celgene already has a handful of drugs in its pipeline that are adding to its growth. Drugs like Pomalyst for multiple myeloma, and Otezla for plaque psoriasis, are growing quickly, and the company has a pipeline that's full of opportunity. This company's future is looking so bright that its management team is guiding for sales in 2020 to exceed $21 billion, and for earnings per share of at least $13. Those figures suggest double-digit top- and bottom-line growth over the coming five years. And yet, despite the company's strong competitive position and fast growth, shares can be purchased for less than 17 times next year's earnings estimates. That's a low price for a high-quality business like Celgene, so I think that right now is a great time to pick up a few shares. Not only are Wells' shares down about 20% from their highs, but they are trading at a valuation that's pretty close to dirt cheap. The current 1.35 price-to-book value is the lowest the bank's' stock has sold for since 2013. Its price-to-earnings ratio is just over 11, also on the cheap side for such a high-quality business. Why is Wells on sale? A couple of reasons, most notably a major decline in the value of nearly the entire banking sector over the past several months, largely on concerns over interest rates not climbing, and more recently, the concerns over Europe's economy following the "Brexit" vote. Wells recently downgraded its earnings forecast slightly, and the Brexit will certainly have some impact on banks. Many will need to relocate their European headquarters out of London and onto the European continent. But these seem to be short-term problems, and Wells Fargo is the rare bank that's proven it can generate consistent market-beating long-term returns. There's no better time to buy such a business than when it's on sale. It looks like July is an ideal time to do so with Wells Fargo.